My friend Nicole of Prevention RD is expecting and to celebrate the coming of her daughter Shea, a few food blogger friends have come together to throw a Virtual Baby Shower for her! There's no doubt that if we all lived closer together to meet up in person, we'd have quite a delicious spread. Be sure to head on over to Kim's delicious site, Feed Me Seymour, for the rest of the virtual baby shower offerings from fellow food bloggers! For the baby shower, I contemplated on what to share. The last time I spent time with Nicole and her husband was last summer after a day picking blueberries and raspberries at a local farm. I initially thought of preparing a dish incorporating blueberries or raspberries but my mind when blank. Then the idea of a 'bun in the oven' inspired me. 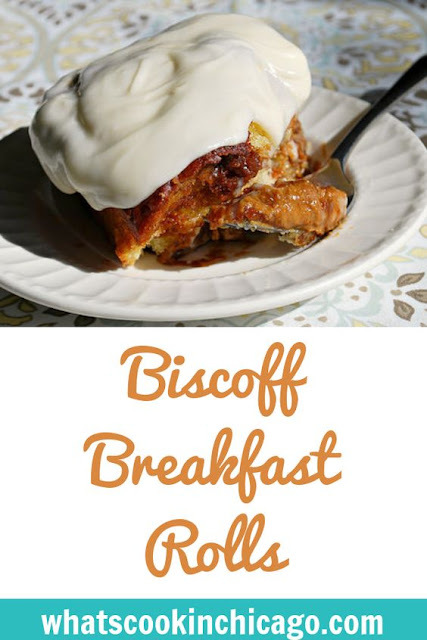 As a result, I'm sharing these Biscoff Breakfast Rolls. I absolutely love that the recipe for the brioche dough is one that can be made in advance, kept in the fridge and baked up as needed. That's definitely a great advantage since Nicole will need all the time she has to snuggle with her little one! Once the dough is made (bonus: it's made without a stand mixer! ), its just a matter of letting the dough proof and rolling it out. 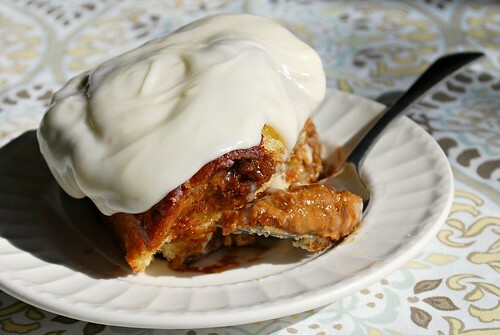 Cinnamon sugar is sprinkled on top followed by a healthy amount of Biscoff spread for the filling. The dough is then carefully rolled up, cut and left to rise once more before it bakes up. Just before serving, whip up some cream cheese frosting, top your rolls while slightly warm and enjoy how the frosting just melts right in for the most amazing way to start your day! I wish Nicole and Mark the most amazing time of their life as they enjoy their little bun in the oven! Mix in the flour a1/4 cup at a time, using a spoon until all of the flour is incorporated. Cover (not airtight), and allow to sit at room temperature for about two hours or until dough doubles in size. Punch down dough, cover and chill in the refrigerator for at least 2 hours or overnight. The dough must be chilled so that it can be easily rolled and worked with. The dough will keep in the fridge for 3-5 days. When ready to work with the dough, remove from fridge and transfer onto a lightly floured surface. Lightly knead the dough my folding it onto itself to wake up the gluten. Roll out the dough to a 1/4 inch thick rectangle, using flour as needed to prevent dough from sticking. Spread the Biscoff over the cinnamon sugar mixture in an even layer. Starting on the longest side closest to you, begin rolling the dough using your thumbs. 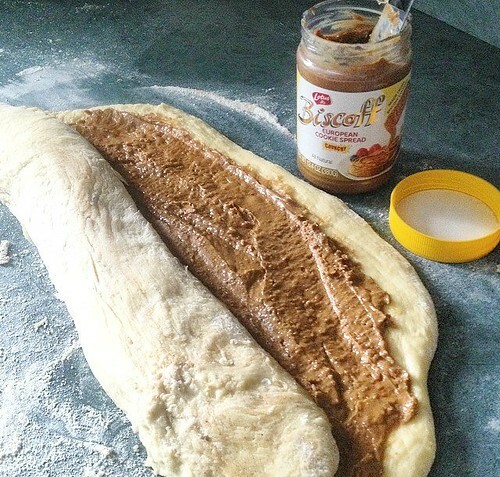 Continue rolling until you've reached the other side of the dough and formed a log of rolled dough. Using a sharp knife, cut the log until equal pieces - the thicker you cut the pieces, the larger the rolls will be. Place each piece cut side down onto a lightly greased baking pan. Loosely cover with plastic wrap and set aside in a warm place for 1-2 hours to proof and expand in size. Do not skip this step! Allowing the rolls to expand and rise will result in a light, fluffy and airy texture. If you don't allow the dough to rise, the rolls will come out dense and tough. Preheat oven to 350 degrees and bake for 20-25 minutes or until tops are golden brown and a toothpick comes out clean when inserted in the middle. Remove from oven and allow to rest for 10 minutes. Serve with icing or cream cheese frosting (recipe follows) if desired. I really hope you saved me some. I want to stop by with a plate and a giant fork. Bun in the oven theme...I love it! And, I love anything Biscoff, oh my lawd!! I'm so thankful for you participating in Shea's virtual shower -- it means so much! And you're so right about being pregnant...it is not easy. But I guess being a mom won't be, either. ;) But, what a rewarding experience both have been and will be. I just can't wait to meet my little girl!! :) Thank you, Jo!! !